Squeeze excess liquid from tofu and wrap in a thick dish towel. Place something heavy on top. Allow at least 10 minutes for the tofu to dry out as much as possible. 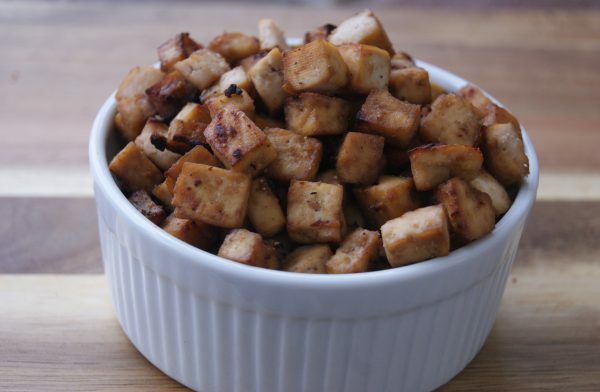 Cut tofu into small chunks. Smaller chunks will be more flavorful and chewier than large chunks. Place in a medium size bowl. Add tamari, vinegar, coconut aminos and garlic to blender. Blend on high until frothy and smooth. Pour mixture over tofu chunks and stir. Allow mixture to sit for a few minutes, stirring periodically to maximize the absorption of the marinade. Transfer to baking sheet. Bake for 45 minutes, stirring every 10-15 minutes so that tofu cooks evenly.